Cancer Prevention: Mulberries are good source of resveratrol, a potent phytonutrient that helps to prevent cancer. More Vitamin C than Oranges: Getting plenty of vitamin C is important for supporting the immune system, repairing tissue, and protecting vision. 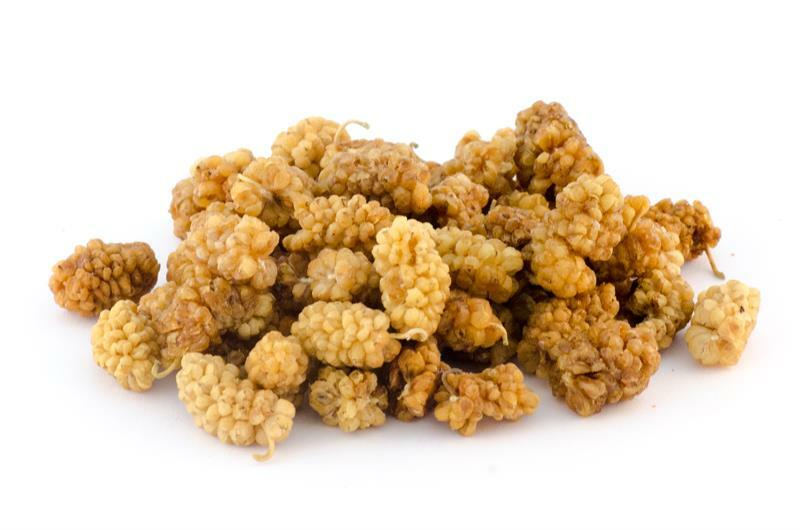 Dried mulberries contain even more of this immune-boosting vitamin than orange. Also it contains great value of vitamin A and E.
Rich in Protein: Mulberries are an unusual high source of protein for a fruit which makes them a great post-workout snack. Healthy Food: Dried mulberries are a great source of protein, vitamin C and K, fiber, and iron & calcium. Raw, golden soft sweet berries. Storage: May be stored at room temperature or in the refrigerator for up to 1 year. They should be kept in a sealed bag or container, away from heat and direct sunlight.